Research into human ageing is a growing field of research with two central foci: geriatric medicine works to reduce the incidence and severity of age-related diseases and disabilities by devising adequate therapeutic and preventive strategies. A second focus, this time in the emerging field of biogerontology, is to bring about a general retardation of the ageing process and by this increase the average and maximum human lifespan. This contribution looks into the second focus, i.e. the possibility of age retardation which, for the time being, is merely hypothetical. After outlining research strategies studying age retardation in animal experiments, it will ask how extending human life by technological interventions might play out on the individual, familial and social level. The central concern here will be autonomy-linked issues, seeing that in debates concerning the ethical implications of age-retarding techniques the argument from autonomy is one of the main arguments in favour of the prolongation of human life. 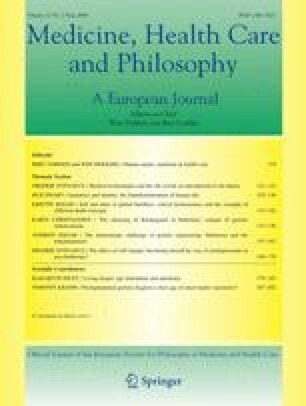 In particular, this contribution will assess whether the argument from autonomy does, in fact, unequivocally support the recourse to age-retarding techniques.